What do you do when you have an abundance of plums? Can them, juice them for future jelly, dehydrate them, and make plum jam! 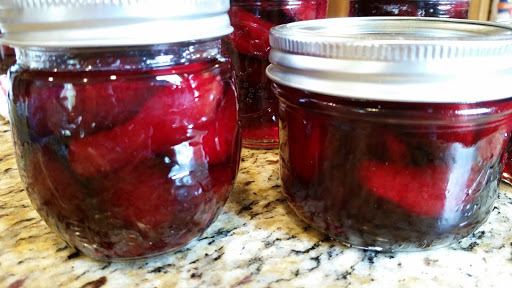 This may be the best plum jam recipe ever! Wash, quarter, and remove the pits from the plums. Place the plums in a large glass bowl, add the sugar and lemon juice. Let macerate for one hour. After one hour, pour the contents into large pot and bring to a simmer. Let simmer until all the sugar is dissolved. Return to the bowl, cover with parchment paper, and refrigerate overnight. The next day, strain the fruit through a fine mesh sieve. 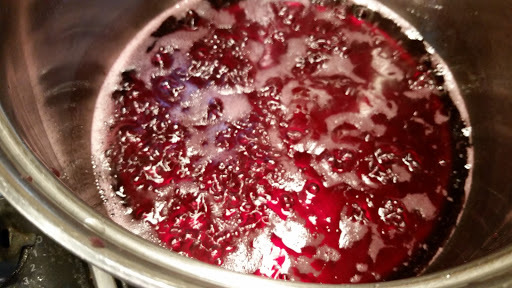 Bring the juice to a boil and cook for 5-10 minutes until the temperature reaches 221 degrees. Add the plums to the juice, bring to a boil and cook for 3-4 minutes or until it sets, stirring gently. Put into sterilized jars and water bath for 10 minutes. This recipe will make five 8 oz jars of deliciousness.